These portable and cost-effective ‘X’ frame banner display units are designed to hold a digitally-printed vinyl graphic with a metal eyelet grommet in each corner. 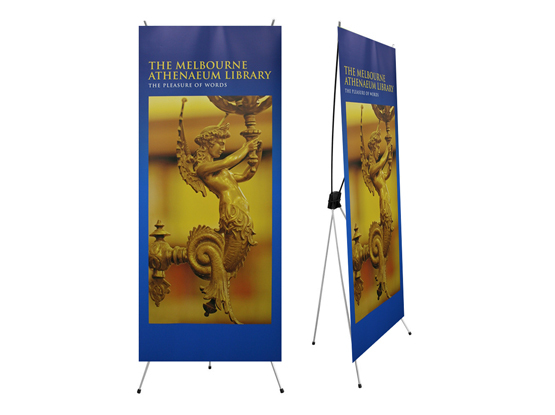 Like the retractable pull-up banners, the ‘X’ banner stands are also suitable for exhibitions, conferences, seminars, presentations and point of purchase situations. An ‘X’ banner stand is incredibly simple to erect and very effective at drawing attention. Once you have the display stand, changing the graphics is quick and easy. High-quality digitally-printed replacement graphics can be purchased from Reed Signs if required at the best possible price. Call us today and talk to one of our friendly staff about a point-of-sale solution that fits your budget and signage requirements.